Border Patrol agent Vincent Pirro looks on near where a border wall ends that separates the cities of Tijuana, Mexico, and San Diego, Feb. 5, 2019, in San Diego. A wall at the U.S.-Mexico border became Trump’s signature promise -- a call and response at all of his campaign and post-campaign rallies, a symbol of his contempt for illegal immigrants and the centerpiece of his draconian immigration policies. Yet, a­­s much as the billionaire former New York real estate investor says he wants it, there is still no trace of the towering, gleaming, all-encompassing border wall he originally promised. More than two years into his first term, all Trump has to show is eight wall sections erected on a dusty plot of scrubland near San Diego. This month, previously planned construction begins on 9.5 kilometers of levee wall in the Rio Grande River Valley in Texas, marking the first wall construction during the Trump presidency. The president's insistence on $5.7 billion of U.S. taxpayer funds for the wall over Democrats’ objections and tepid­­ public support led to a 35-day partial government shutdown in December and January, and another one threatened for February. The spending deal finally struck by Democratic and Republican negotiators -- and expected to be approved by Trump -- was an unmistakable setback for the president. It provided $1.375 billion for 88 kilometers of fencing, only a quarter of the money he sought, and a fraction of the 322 kilometers of new wall he demanded. Trump said he was “not happy” with the compromise, but was unwilling to torpedo the agreement and trigger another shutdown. Instead, he hinted at seeking executive action to shift funding from other accounts to supplement the cost of a wall. Currently, some kind of barrier exists on 1,127 kilometers of the U.S.-Mexico border, about a third of the 3,145-kilometer boundary. While Trump’s focus on building a wall has not changed, the wall itself -- or his idea of the wall -- has steadily contracted. What started out as a concrete barrier along the border “from sea to shining sea” has devolved into something “see-through” or built with metal slats, constructed where there are no natural barriers. Recently, Trump resolved to "just call them walls, and stop playing political games,” as if the term were merely a label that could be affixed to anything. Five days after he was sworn in as president, Trump issued an executive order authorizing the wall and earmarking whatever federal funds could be found to pay for it, to combat “a surge of illegal immigration." “'Wall' shall mean a contiguous, physical wall or other similarly secure, contiguous, and impassable physical barrier,” the order specified, to be built all along the southern border. A month later, Customs and Border Protection announced it would accept design concepts from construction companies and award contracts after reviewing their bids. By now, spurned by Mexican officials, Trump had abandoned his fantasy that the Mexican government would pay for it. CBP didn’t have the money. Its parent agency, the Department of Homeland Security, could only find $20 million in existing funds for the wall, which it estimated would cost $21.6 billion. ​The money would cover only eight prototypes -- with nothing left over for actual wall construction. Trump vowed to renew the fight when the fiscal year (FY) 2018 budget was discussed in September, and if necessary, shut down the government -- a threat that would become a refrain until it became a reality. During the next two budget cycles, Trump exhibited a pattern: big demands, lots of posturing, and when rebuffed, an even bigger demand. On Oct. 1, 2017, when the new budget would have taken effect, the government was operating on money provided by a short-term funding bill, the first of five that would keep the government running through March 2018, with the exception of two brief shutdowns. In his original budget request, Trump asked for $1.6 billion as a down payment on the wall. This was approved by the Republican-dominated House of Representatives in July. But it wouldn’t pass the Senate, where the majority needed Democratic votes to clear parliamentary hurdles in passing spending measures. Yet in early December, Trump pushed for $25 billion in wall funding. Why had he so greatly increased his request, when Congress was already deadlocked? 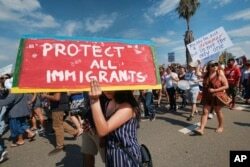 A key issue at the time was the fate of the Deferred Action for Childhood Arrivals (DACA) program, which sheltered young immigrants brought to the U.S. as children from deportation and allowed them to work. ​Trump was ending DACA in March unless Congress acted to save it. Democrats badly wanted a fix for the DACA program, which also allowed recipients to work and go to school. An obvious deal would be for Trump to support a legislative extension of DACA in return for Democratic support of wall construction. In the first three months of 2018, Trump had three chances to obtain full wall funding. He rejected them all. The First. In mid-January, with the third short-term spending bill set to expire in hours, Senate Minority Leader Chuck Schumer of New York met with Trump over cheeseburgers to head off a government shutdown. Schumer reportedly offered $25 billion for the wall over 10 years in exchange for a path to citizenship for DACA recipients. Reports say he left thinking he had a deal. But White House Chief of Staff John Kelly later called and quashed it. A 69-hour shutdown followed. Three days later, Trump introduced his “Four Pillars" immigration reform plan: No deal without wall construction. An end to family-based migration. An end to the diversity visa. A solution for DACA. The Second. In mid-February, Democrats and some Republicans introduced a bill that included $25 billion for the wall over a 10-year period, and DACA. While it contained additional immigration provisions, it did not address the other pillars. The bill subsequently failed in the Senate. The Third. In March, with another funding deadline looming, Democrats offered $25 billion for the wall in a flat exchange for citizenship for DACA recipients. Republicans countered with a 2.5-year extension for DACA. Democrats rejected that offer as unbalanced because it called for permanent funding for the wall but only a temporary fix for DACA. By this time, the courts were keeping DACA going while its constitutionality was tested. There no longer was an urgency to preserve the program through congressional action. When the budget was finally signed on March 22, lawmakers had approved only $1.375 billion for border security, none of which included construction of a border wall. In a tweet, Trump threatened to veto the bill. But he signed the measure, vowing never to do it again. If there was a silver lining to not getting wall authorization, it was that Trump could use the issue to whip up voters in advance of the 2018 midterm elections. Senate Minority Leader Chuck Schumer, D-N.Y., speaks to reporters at the Capitol in Washington, Jan. 29, 2019. ​His depiction of escalating danger at the southern border was the core of his campaign stump speeches for Republican House and Senate candidates. While chants for the wall were vehement as ever at campaign rallies, no big constituency showed up at the polls. Republicans won a few additional seats in the Senate, but Democrats swept the House and set up a new dynamic: a divided government. In September, outgoing House Speaker Paul Ryan of Wisconsin had promised a “big fight” over wall funding. A few weeks after the election, here it was. Trump showed his hand: DACA and the other pillars had fallen away. All he wanted was $5.7 billion for the wall. Earlier, Congress had given tentative approval to $1.6 billion. ​In a bizarre, mid-December squabble with Nancy Pelosi, the presumptive new House Speaker, and Schumer at the White House, Trump declared, “I am proud to shut down the government for border security. ... I will take the mantle. ... 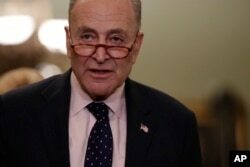 I won't blame you (Schumer) for it." ​As a result, he owned the 35-day partial shutdown that followed, leaving 800,000 government employees without paychecks, curtailing government services and costing the economy billions of dollars. As another government shutdown loomed this week, a bipartisan committee of 17 Senate and House members agreed on a compromise that Trump has reluctantly agreed to sign. Two years. Two budgets. Two prolonged fights over funding for the wall. In each case, the final compromise fell short -- not only of what the president was demanding, but also short of what he could have had if he'd just taken what was initially offered. In both FY2018 and FY2019, the White House began by seeking $1.6 billion for border security. After an exhaustive six months of posturing, negotiating and shutting down the government, lawmakers agreed to less in both years, and only 88 kilometers (or 55 miles) of fencing in all. It was almost as if Trump -- long touted as a master deal maker -- were reverse negotiating.